Date: Apr 21 2018, 10 a.m. - 2 p.m. 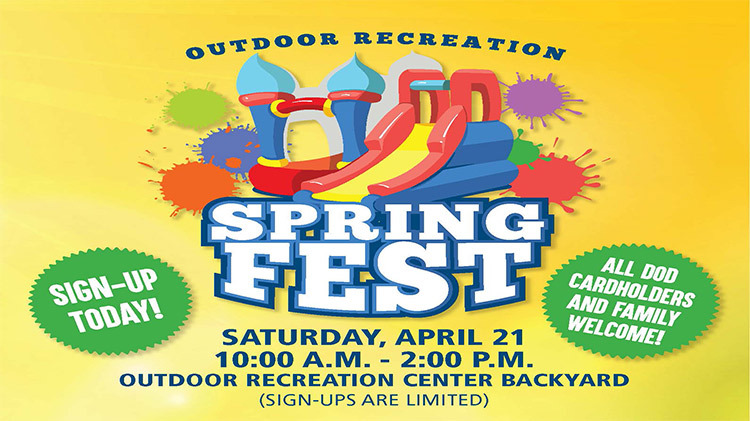 Outdoor rec is throwing a welcome to Spring Festival and you are invited! Come in and see what Bldg, 2110 is all about. Admission includes UNLIMITED: Bubble Soccer & ReBall/Paintball for those 10 years and up. All participants are welcome to: 5 bouncy castles, cotton candy, shave ice, popcorn, backyard game tournaments and jousting. There will be sack races and a ladder ball tournament. Entries are limited so come sign-up today! Call or visit Outdoor Recreation.